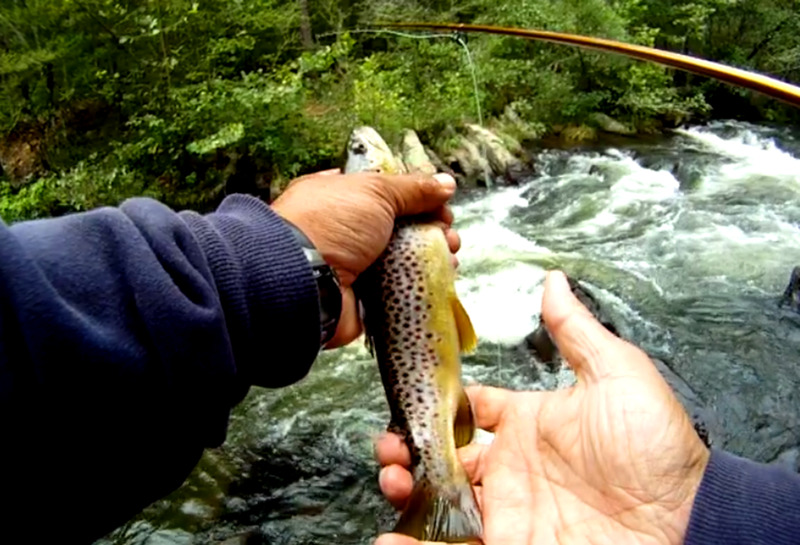 A couple of videos of fishing trips to the Lower Mountain Fork River! Two trips and two Keepers from the Red Zone! Both Keepers went 20" in length! Do check them out! One went for a Y2K Egg Pattern trailed behind a Near Deere. The other took a Rainbow Warrior also trailed behind a Near Deere. Even better, we were able to get some underwater video clips of the Trout lurking in the pool we were fishing! Heavy rains in May 2015 resulted in flood damage to the area. Bridge crossings were lost and road damage was extensive. 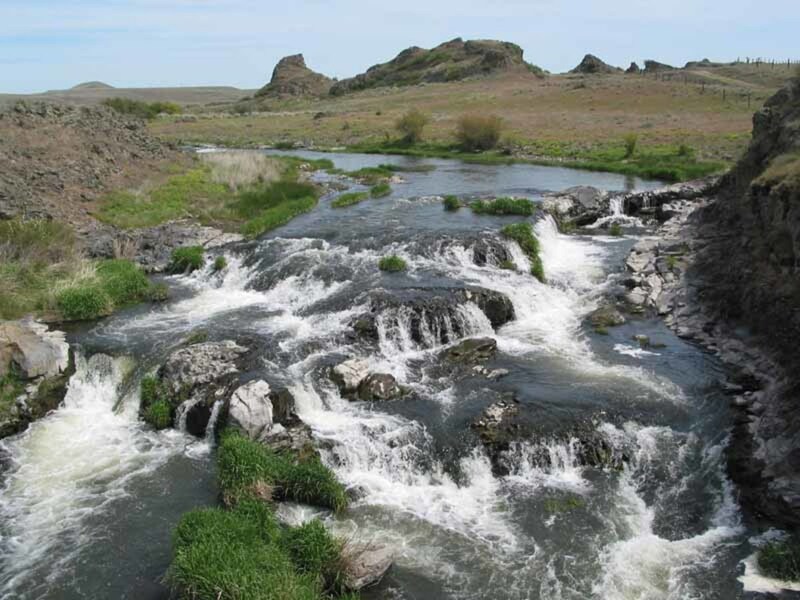 Moreover, key areas like Spillway Creek, Lost Creek, the Cold Hole, and Evening Hole have undergone a drastic change... it's like a new river to be learned, explored, and fished! Do check out the videos in the August 2015 Videos section below to get an idea how things have changed! 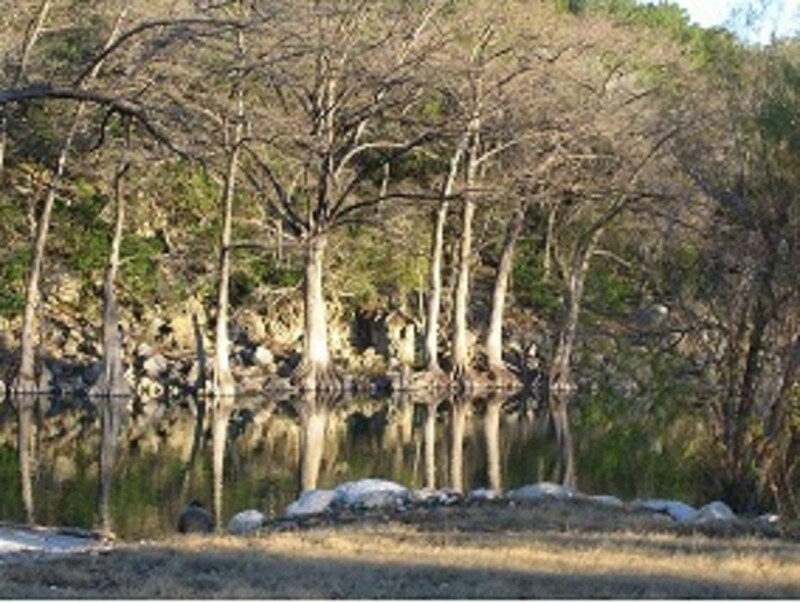 Living in North Texas, fishing for Rainbow Trout is dependent on the annual Trout Stocking Program managed by the Texas Parks and Wildlife Department. The Program stocks Rainbow Trout beginning late November each year and runs through February/March the following year. Since I have other fishing opportunities to occupy my time, I don't mind waiting until late November to fish for Rainbow Trout. Summer fishing trips to Galveston and/or Port Aransas for saltwater fish are always a blast! Weekly (sometimes more than weekly) outings to the local reservoirs for Striped Bass, White Bass, and Catfish are great for Beer Batter Fish Fries! And, daily (not so much recently) quick trips to community lakes and ponds make it easy to forget about fishing for Rainbow Trout. Moreover, starting in November, I can make a few quick trips across the border to the Blue River in Oklahoma if I want to start the Season a few weeks early! The Blue River is less than two hours from Dallas making it an easy day trip for North Texans; it is stocked with Rainbow Trout starting November 1 to March 31 and has a "put and take" section as well as a '"catch and release" section. Also, there are two Trout Fishing Derbies hosted by a local organization and typically scheduled Veterans' Day and Presidents Day weekends. Each Derby includes a supplemental stocking of larger Rainbow Trout (5-10 "pounders") that will make things interesting for those lucky enough to hook one! However, this year was different. A cool front arrived earlier than normal dropping temperatures into the 50s last Saturday (September 13, 2014). As a result, my urge to go Rainbow Trout Fishing came sooner than expected! As it was still September, the Blue River was not an option. Its first stocking was a good six weeks away. And, a day trip to the Guadalupe River in New Braunfels was out of the question. Being four hours away and assuming Highway 35 traffic conditions were favorable, more time on the road then time spent fishing made little sense. Then, I recalled others recommending the Lower Mountain Fork River at Beavers Bend State Park. It was about three hours away. The route offered "not so congested" roads compared to Highway 35, so a day trip would not be unreasonable. Taking about five minutes to mull it over, I decided to go for it and make a day trip across the border to the Lower Mountain Fork River! 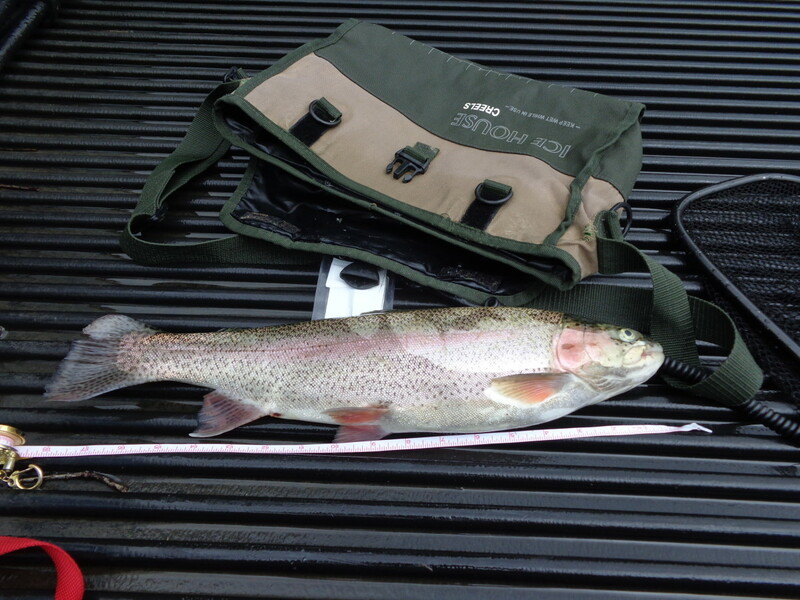 18" Rainbow Trout caught at Spillway Creek on August 22, 2015! 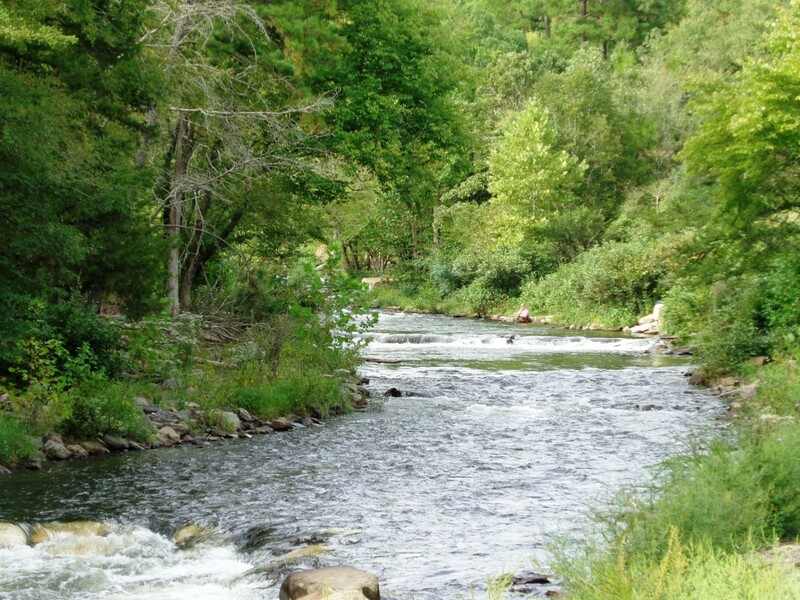 The Lower Mountain Fork River is located in Southeast Oklahoma near the town of Broken Bow. It offers year-round trout fishing on a twelve mile section of the river from Broken Bow Reservoir spillway downstream to the U.S. 70 bridge. 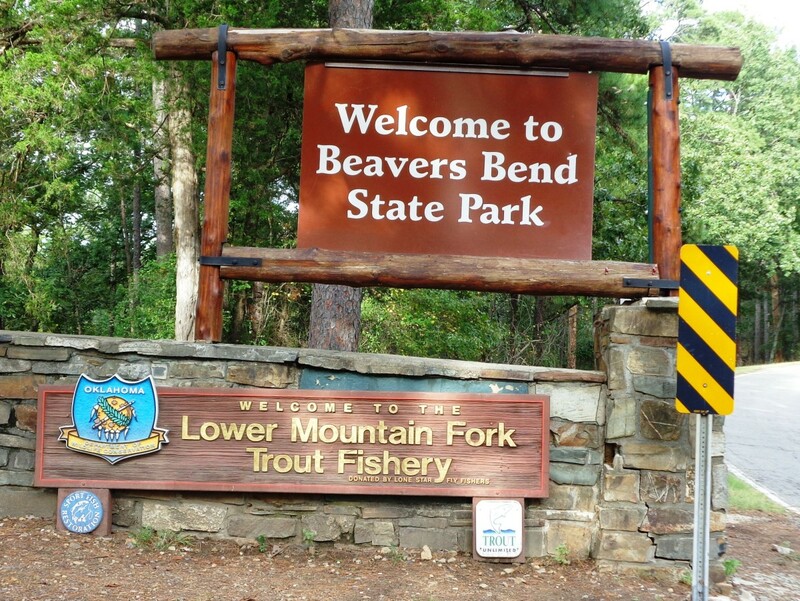 Five miles of the Lower Mountain Fork River lies within Beavers Bend State Park which offers camping and cabin facilities. In addition, the area is stocked year-round by a third-party fish hatchery contracted by the Oklahoma Department of Wildlife Conservation. Trout and Special Regulations apply. For more details, be sure to check out the Trout Stocking Schedule and the Oklahoma Fishing Guide. All trout in possession must be kept on a stringer with the angler's name and fishing licence number. Note: As regulations may change from year to year, be sure to review the latest regulations posted by the Oklahoma Department of Wildlife Conservation on their website at www.wildlifedepartment.com. Having decided to fish the Lower Mountain Fork River, I did a quick check online for two things - a fishing license and driving directions. For the fishing license, since I had bought a non-resident fishing license online several years ago, it was easy to log in and order a new one. In less than five minutes I had my Oklahoma Non-Resident Fishing License in my wallet. It cost me $55 plus another $3 for the online fee. It was good until December 31,2014, so another purchase would be needed in 2015. 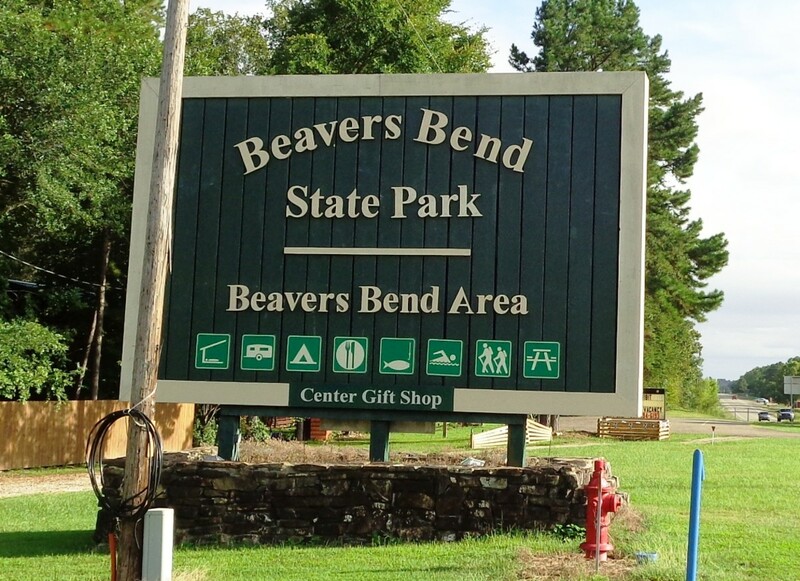 Next, I went to Mapquest and entered my starting location and my destination Beavers Bend State Park. It did not find the park initially but by dragging the end location to the right spot, I was able to get directions for a route that would take me approximately three hours. The directions were good and it did take about 3 hours but I did stop for coffee and food on the way. Also, there was one turn that was wrong. Mapquest indicated a left turn when it should have been a right turn. It was a good thing I had Google Maps to check the route in real time on my phone! Overall, getting there was not bad at all. There was virtually no traffic and the nice scenery made the drive time easier. It did not feel like a three hour drive! For the remainder of this article, I will describe the day trip through pictures, descriptions of key points of interest in chronological order, and a video clip of the day's action. Finally, I will summarize the day, and then post links to some useful tips from other anglers who frequent the area. Passing through the town of Broken Bow as I drove North on Hwy 259, I kept an eye out for Hwy 259A which would then take me into Beavers Bend State Park. Sure enough, on my right I spied the big sign that is pictured in the sidebar. It's large, so it is tough not to miss it when driving! After a few twists and turns along Hwy 259A, I came upon the entrance to the park. I still had several miles of winding roads to get to my first destination but the tall trees and forest environment made a nice change from the suburban/urban area where I live. PS: I did notice that cell phone coverage was lost once I entered the park. I decided to stop at the Forest Heritage Center to pick up a few informational brochures (and to take a restroom break... lots of coffee on this road trip). Grabbed two brochures - State Park Regulations and the Beavers Bend Trail Guide. 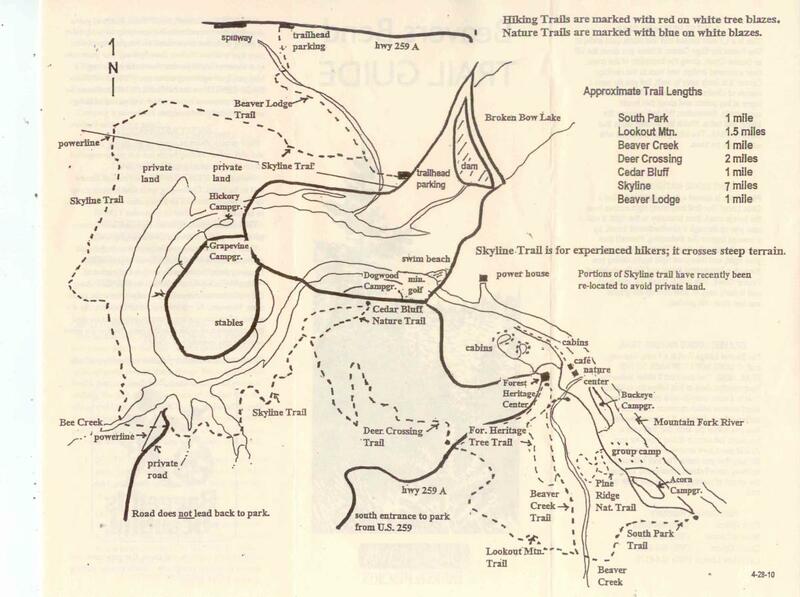 Of the two, I posted a scanned copy of the trail guide at the end of this article. Do check it out! 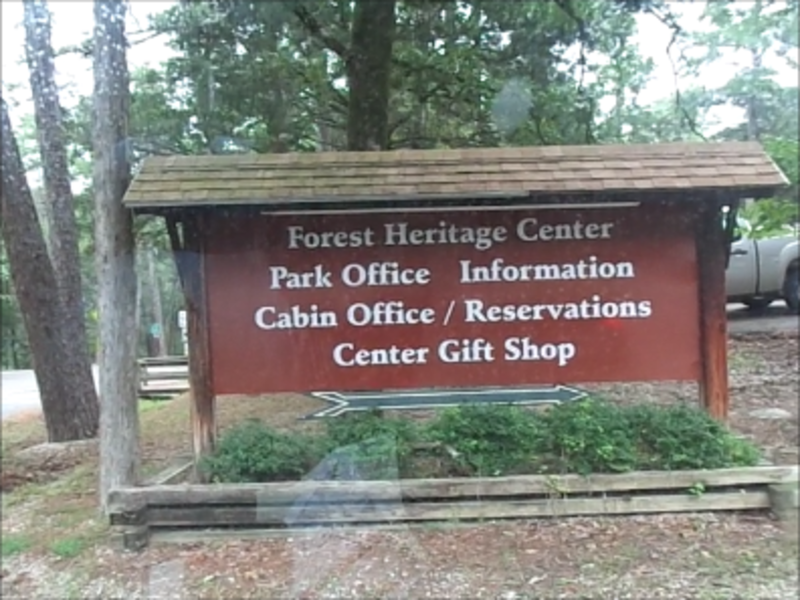 I really liked the Forest Heritage Center. 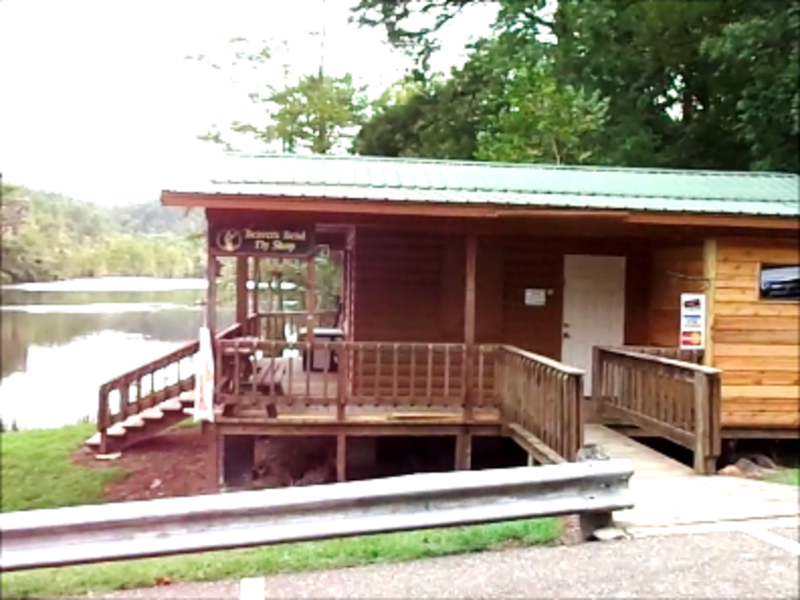 It has a camp store and serves as the check-in location for camping and cabin rentals. Just down the road was my next stop - the Beavers Bend Fly Shop. Although I arrived about twenty minutes before the Shop was officially open, I was quickly invited to come on in when I walked up to the door. Here I was able to get the latest Oklahoma Fishing Guide that contained the current fishing regulations. I also was given a brief but detailed summary of the fishing regulations as they applied to the Lower Mountain Fork River and learned that the area was recently stocked on Thursday! And then, I purchased a few suggested fishing flies recommended by the Fly Shop. Finally, I asked about possible starting locations to fish and was given another brief but detailed summary of places to try. ... except, I went too far and ended up at the Dam. 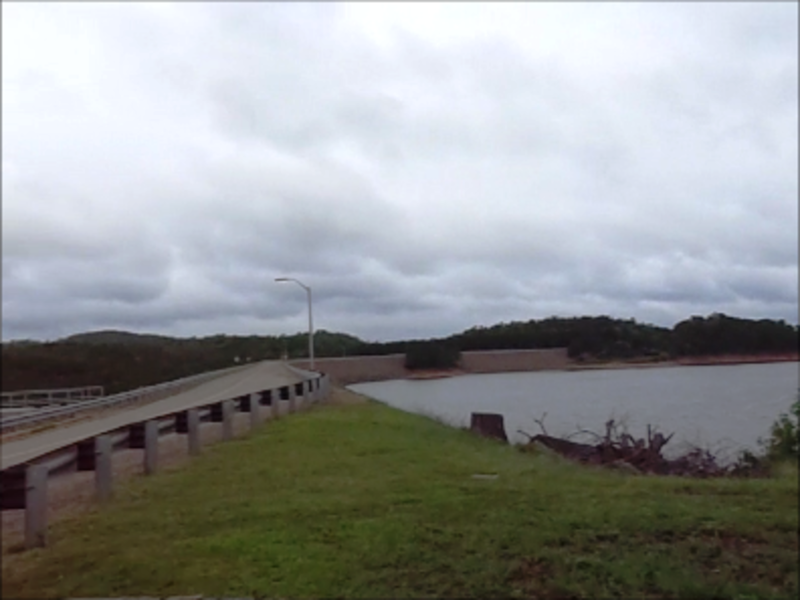 I decided to head across the Dam, and then stop at a scenic overlook that also offered ample parking. Here is where I stopped briefly when I noticed I had cell phone coverage. It was roaming but it still allowed me to make a phone call to my significant other to let her know I made it to the Park in one piece. Go figure... she was asleep when I called her. No worries, this road warrior was ready to rock... I mean fish! After turning back from the scenic overlook, I backtracked to a bridge crossing. It had a parking area, signs that indicated it was a Blue Zone on one side, and a Red Zone on the other side once you crossed a wooden footbridge. 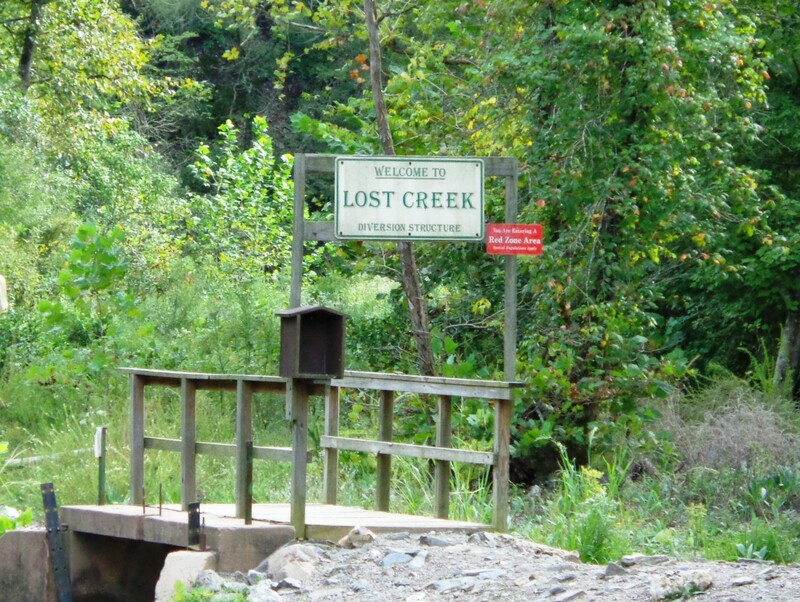 I also saw a "Lost Creek" sign over the wooden foot bridge that I figured meant you were entering Lost Creek. As good a place to start, I parked the truck and made preparations to fish the Blue Zone side. 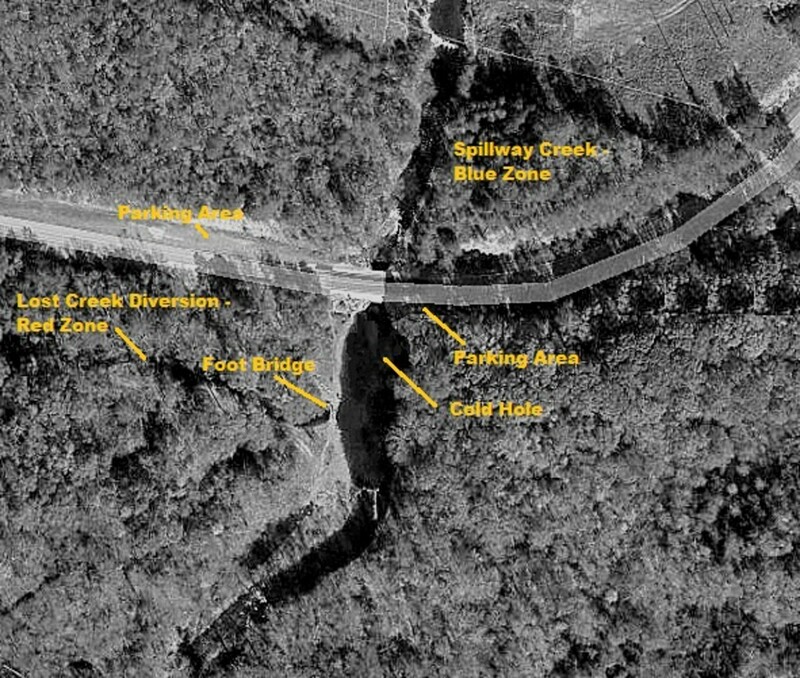 I later learned this Blue Zone area was called Spillway Creek. Several parking areas providing ample parking. A wooden foot bridge that marked the start of the Lost Creek Diversion and the Red Zone. Spillway Creek and signs indicating it was a Blue Zone. Cold Hole (not marked but referenced in maps) was immediately downstream from the bridge crossing. Here is a short video clip of the day's action. I mainly fished Spillway Creek but did check out Cold Hole and several pools in Lost Creek. What is your favorite trout? 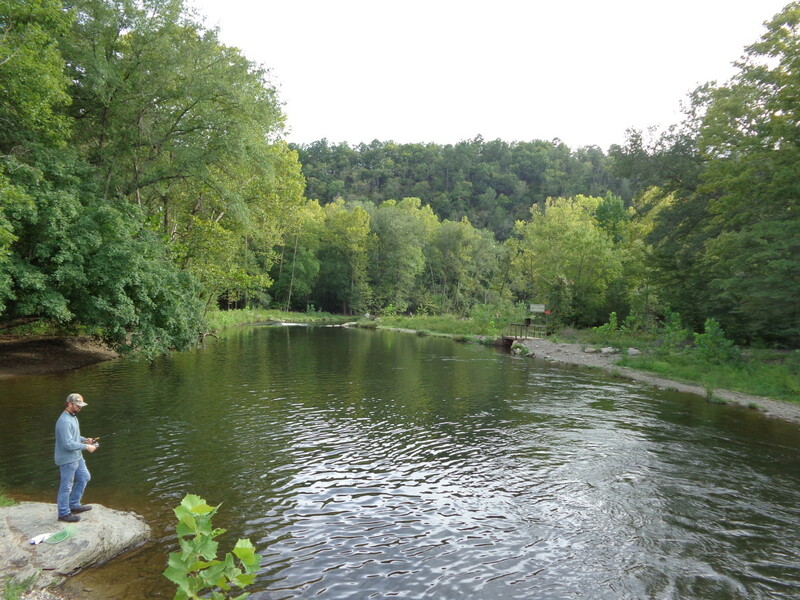 It was my first trip to the Lower Mountain Fork River, and I was not sure where to start fishing. So, I decided to drive around and check out the river access points marked on the park map. In a short while, I went too far and ended up by the dam. No worries though, I was able to backtrack down the road until I came across a bridge crossing with a sign clearly marking a Blue Zone. And, much like the way I decided on taking a day trip to Oklahoma, I decided to start fishing the area on a whim; I later learned the area was called Spillway Creek. First impressions were promising as I walked the trail along Spillway Creek. I passed several fishermen with stringers of Rainbow Trout - some looked to be 18" or more in length! As I continued on, I met a young fisherman who was headed in the other direction. I asked if the fish were biting, and he excitedly stated, "Yes, I had a big'n but he done broke me off!" Knowing there were "big'ns" in the river, I was ready to wet a line and hook into one. At the first open pool, I began fishing without a strike. I then moved on to the next pool, and I again fished without a strike. This pattern continued for a couple of hours except I did start getting light strikes and an occasional hook up with a little Trout (that would quickly wiggle off the hook as I tried to land it). By later morning, I started finding my "mojo" and began hooking and landing the little Trout that were striking my fishing fly. After catching and releasing several little Rainbow Trout, I lucked into a Brown Trout that was lurking near the river bank. It put up a great fight, had some beautiful markings,... not bad for my first Brown Trout! 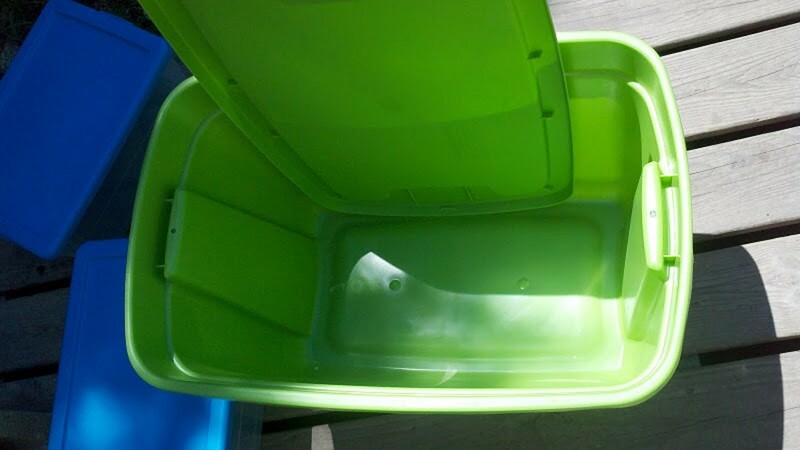 After letting it go, I made several more casts before heading to the next pool. The next pool as well as the next series of pools yielded more little Rainbow Trout. In hopes of a larger fish, I decided to work my way up the creek looking for larger trout lurking in the river. Although I had polarized glasses on, I did not see any large Trout. I did this until I decided to turn around when the trail crested high on a hill. At that point, I began working my way back down river. Along the way, I caught a few more little Rainbow Trout before I settled in one pool that had a nice run, some riffles, and lots of pockets that looked like they could hold a fish or two. In short order, I caught another little Rainbow Trout, missed several slightly larger Trout before landing one that went about twelve inches or so. And then, I hooked and fought a nice Rainbow Trout that looked like it would beat twenty inches easily. Unfortunately, it came off the hook, and I lost it! Oh well, what to do... Keep on fishing! The remainder of the day was spent catching and releasing little Rainbow Trout in Spillway Creek, watching more little Trout feeding on tiny "somethings" that were smaller than a Size 22 Midge in Cold Hole, and then casting to several larger Trout lurking in the pools along Lost Creek! Overall, the day's action was steady with lots of little Rainbow Trout to keep things busy between the occasional larger Trout strikes! I was glad to have made the six hour round trip, and I am certain that I will return for more! Thank you for stopping by, below are links to some useful tips from other anglers who have fished the Lower Mountain Fork River for Trout! 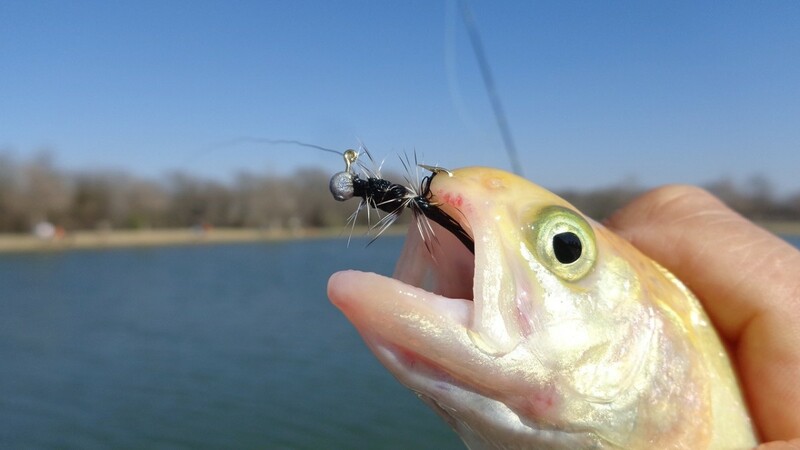 A good source of information about fishing the Lower Mountain Fork River is posted on the Texas Fishing Forum. Of note is the Freshwater Fly Fishing section - specifically, Lower Mountain Fork River Fishing Guide Report with Video and Pictures! Do review this thread before making a trip to the River! 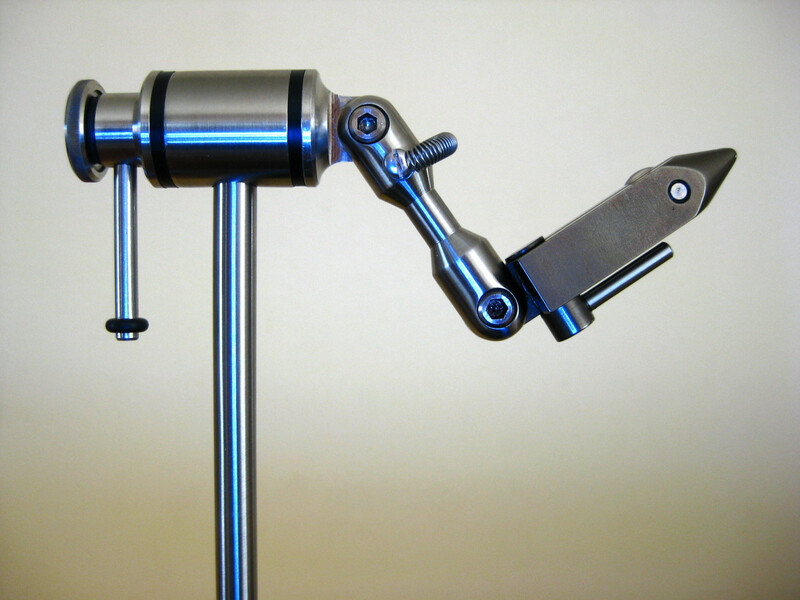 One key take away from the link to the Texas Fishing Forum is the Neer Deere Fishing Fly. 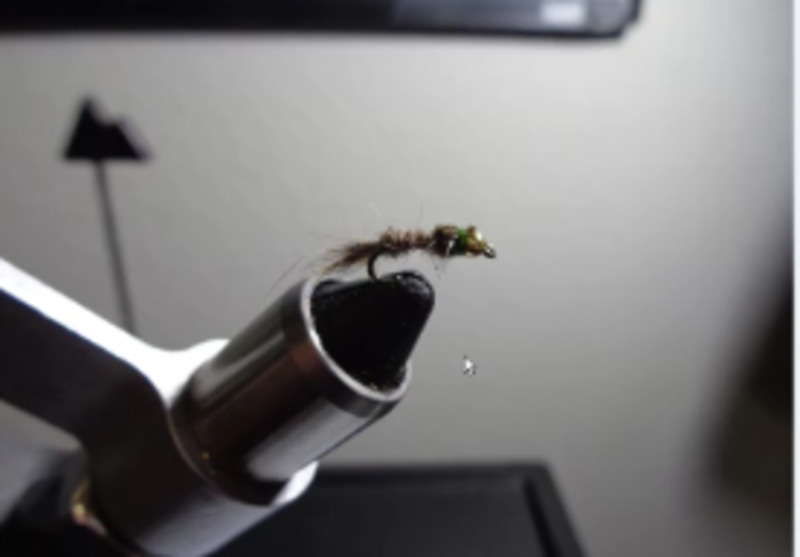 This fishing fly works well for Rainbow Trout! I used this fishing fly as suggested by Texas Fishing Forum Member TarponFly, who is a liscensed fishing guide in Texas and Oklahoma. In the video in the sidebar, you can see the fishing fly doing its job - catching fish! It is a simple pattern to tie, but you can also purchase them directly from TarponFly's Website - Texas Oklahoma Fishing Guide - Online Store! Here is a scanned copy of the Beavers Bend Trail Guide published by Oklahoma Parks and Resorts! Of note is the Beaver Lodge Trail. This is the trail that I should have used when fishing Spillway Creek. I walked the other side of the river and dealt with steeper banks and tight conditions that made for tough casting with the fly rod. Next time, I plan to use the Beaver Lodge Trail. Returned Saturday September 20, 2014 for another round of fishing for Trout. Caught a few, lost a few, saw other catch a few as well. Did lost a couple of nice Trout, and also caught another Brown Trout. This time, the Trout went for a Prince Nymph, GloBug Egg, Red Midge, or a BWO Dry Fly. Went back again Saturday 9/20/2014. Added a video of the action at the end of the article. Check it out when you get a chance! Hope readers enjoy this one. More details on a recent day trip to the Lower Mountain For River in Oklahoma for some Rainbow Trout Fishing! Even caught my first Brown Trout, too!